"When I think of all that children and their parents teach me, I feel blessed. 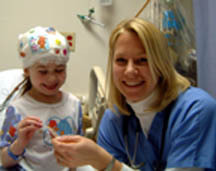 I try to convey to my little patients that they are special, and that I am lucky to get to be their nurse. When they act up, I try to put myself in their place." "Here's a quote that should be posted in every school nurse's office: 'Do you have a headache a stomach ache or a heart ache? I'm here for you.' the quote was on my door, and it brought me a child with a stomach ache caused by her learning of her parents' up-coming divorce." great too, like patty cake."